From the microcosmos to the cosmos, a Cornell researcher's hobbies allow him to understand different worlds. By day, Jarek Pillardy, director of the Computational Biology Service Unit within the Life Sciences Core Laboratories Center, helps bring advanced computational tools and techniques to life sciences investigators. At work, he and his group have helped plant geneticists analyze the global population diversity of maize and rice and have worked with others to determine the genetic makeup (called genotyping) and evaluate the genomes of grape populations; and his team has aided microbiologists to collect genotyping information for food pathogens, for example. But once home, he is devoted to his family and his two time-consuming hobbies: Creating complete ecosystems to raise tropical fish, and astronomy, which he enjoys from a fully equipped observatory in his backyard. "I am a scientific type," says Pillardy, a native of Poland who moved to the United States 15 years ago after receiving his Ph.D. in theoretical chemistry in 1996 from Warsaw University. Regarding his hobbies, he said he wants "to understand and enjoy and see how a system works. It's beautiful." 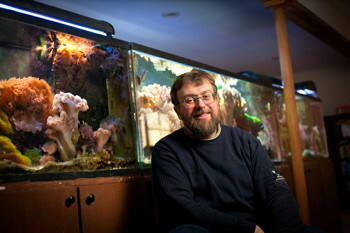 Though Pillardy's interest in fish began when he was 5, the first thing he did after getting married was buy an aquarium. 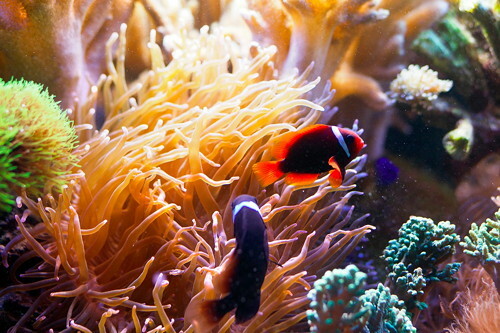 He and his wife, Ewa, decided to start a tropical fish business, breeding clownfish and other varieties, which she managed while home with their two children. 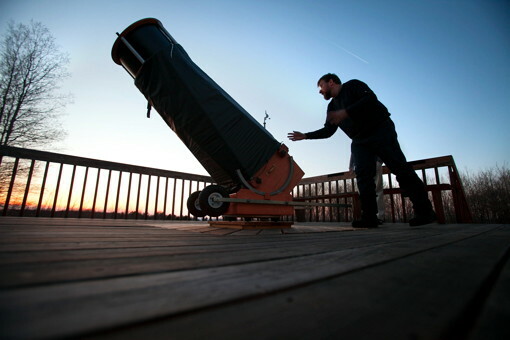 Pillardy on the deck of his backyard observatory. 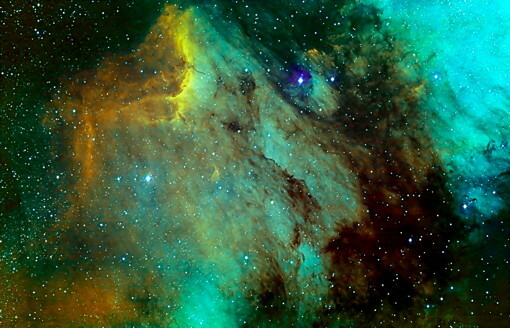 This image of the Pelican Nebula (also known as IC5070) in the constellation Cygnus was made by Pillardy with a 10-hour exposure. At the business's peak, the Pillardys had some 1,500 gallons of water in their saltwater tanks. They sold the fish regionally, transporting them in plastic bags with oxygen and an ammonia neutralizer inside styrofoam coolers. But about three years ago they closed the business as it grew too large and would have required Pillardy to quit his Cornell job to keep it going. "Breeding fish is like farming; it takes a lot of manual labor," Pillardy says. Now, about 700 gallons of water in brightly lit fish tanks teem with clown fish, gobies, shrimp, anemones and coral in the large family room in the basement of Pillardy's house. The tanks are almost completely biologically filtered by bacteria and crustaceans in the sand and rocks, as well as algae in separate tanks and carbon filtration. Yet other tanks that serve as a type of filter – called a "skimmer" – bubble and create waste foam that Pillardy manually skims off the top and tosses. "This is a whole biosystem that you can simulate in your house," he says. "It's about re-creating an entire microcosmos." Pillardy's other hobby looks to the cosmos. When he moved to his Freeville home in 2008, he built a small observatory on his four-acre lot, which is exceptionally dark at night for the area. The observatory is a 15-by-15-foot shed with a roof on a track with a motor that slides it open to one side, exposing the night sky. The observatory also has a deck with a small section in the middle cut away from the floor, so it is free from the deck's vibrations. Here, Pillardy mounted a telescope that won't shake from footsteps. Pillardy owns three key telescopes, two for imaging and one for observing. For imaging, the observatory includes a small control room with computers where data is collected from the scopes. In turn, the telescopes are synched with computers that track stars, planets, galaxies and comets, and motors make tiny adjustments as the Earth turns, thereby keeping the field of view on target. In fact, Pillardy's iPhone is fitted with a planetary program app that knows the coordinates of celestial objects. "I can actually control the telescope with my iPhone," he says. His love of astronomy and astrophysics dates to middle school in Poland, and since then he has read extensively on the subject. "I know a lot about the objects out there, and so observing them makes it very interesting," he adds.